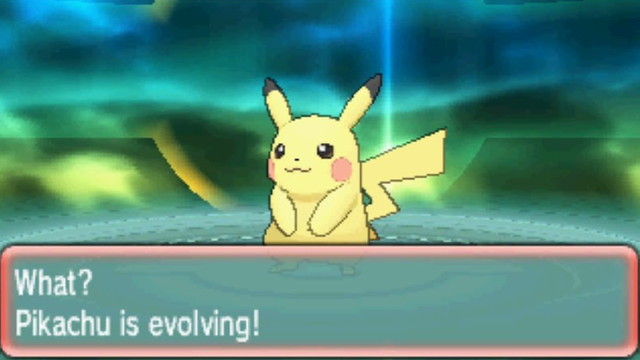 Evolution is a process in which a Pokémon changes into a different species of Pokémon. This change is not merely physical, however, as Pokémon of a higher evolutionary stage have different (and usually more powerful) base stats than their predecessors. These Pokémon may also have different moves that can be learned. And sometimes they even change their types, though usually at least one of the types of the previous form is preserved. Other statistics, such as Nature and EVs, as well as shininess, are preserved. Some Pokémon only evolve once (like Yungoos), others twice (like Caterpie), and some do not evolve at all (like Drampa). There are also Pokémon with branch evolutions, which can evolve into two different Pokémon, depending on the evolution method used. Eevee is the best-known example of this, evolving eight different ways depending on the method used. You can find out how a Pokémon evolves, by looking under Evolution on the Pokémon’s page in our Pokédex. Additionally, holding an Everstone prevents a Pokémon from evolving, as well as surprising a Pokémon by pressing the Ⓑ Button before the Evolution animation would normally run. Friendship (also referred to by fans as happiness) is a measurement of how much a Pokémon is attached to its Trainer and enjoys being in their care. Some Pokémon only evolve when their friendship value is 220 or higher. Note that Friendship is not the same as Affection, which is raised through Pokémon Refresh. Pokémon in the Alola Pokédex that evolve with a high friendship value are: Chansey, Cleffa, Eevee (into Espeon or Umbreon), Golbat, Igglybuff, Alolan Meowth, Munchlax, Pichu, Riolu, and Type: Null. The quickest way to raise a Pokémon’s friendship is to first either catch it in a Friend Ball or a Luxury Ball, and then giving it a Soothe Bell for an extra boost (stacks with the Luxury Ball), which you get from a Pokémon Breeder on Route 3. Then give it a lomilomi massage from the girl next to the incense stall in Konikoni City (Akala Island), which gives the biggest friendship boost of all the friendship-raising activities. After that, the friendship-raising Berries give the most friendship points, though be aware that they also lower EVs. Next, raise its friendship further by doing any of the other activities. You can check how high a Pokémon’s Friendship is by talking to the female Veteran next to the TM Shop in Konikoni City. You can also check it by placing it on Isle Avue in Poké Pelago and then tapping it to get a friendship evaluation from Mohn. Affection is raised by using Pokémon Refresh, and its value is shown by the amount of hearts in the switch Pokémon-screen. Eevee evolves into Sylveon when it knows a Fairy-type move and has an Affection value of at least two hearts. You can achieve a high Affection in Refresh by petting, feeding, and grooming the Pokémon. The fastest way to increase it is by feeding the Pokémon a Rainbow Bean, which increases its Affection to three hearts immediately. Rainbow Beans are fairly easy to find on Isle Abeens in Poké Pelago. Some Pokémon only evolve when levelled up at a specific location. In Alola, Charjabug, Magneton, and Nosepass only evolve when levelled up in Vast Poni Canyon, while Crabrawler only evolves at Mount Lanakila. Furthermore, Eevee evolves into Leafeon when levelled up near the Moss Rock in Lush Jungle, and into Glaceon when levelled up near the Icy Rock in Mount Lanakila. Goodra only evolves starting at level 50 when levelled up during rain. A location in Alola where it always rains is Route 17, just outside Po Town. Note that using Drizzle or Rain Dance does not count, it only works when it rains in the overworld.